In years past, you've probably turned to Etsy, the popular marketplace for handcrafted goods, when you were shopping for a unique, handmade gift for your mother’s birthday. Starting this week, you can also turn to Handmade, Amazon’s newly launched store for artisanal products. 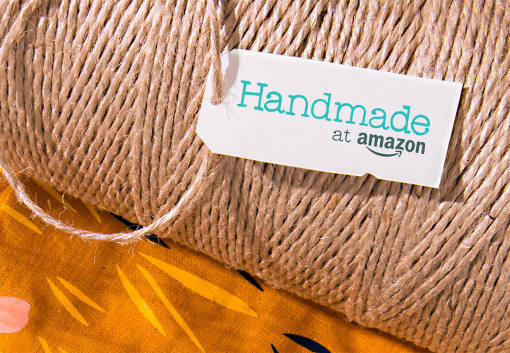 Amazon’s own version of Etsy, Handmade at Amazon is a storefront where invited artisans can peddle their handcrafted wares — crocheted clothing, felt pennants, coffee tables made from reclaimed wood, beaded jewelry and more. At launch time, Handmade listed more than 80,000 items from 5,000 artists primarily from the United States. For now, items are listed in nine categories: jewelry, home decor, artwork, kitchen and dining, furniture, bedding, artwork and stationery and party supplies. More categories will be added soon. Amazon has assured shoppers that Handmade products will be completely handcrafted and that nothing comes from a factory or a mass production plant. To ensure that all products are truly handmade, Amazon puts interested artisans through an approval process to ensure products are made, altered or assembled entirely by hand. Products assembled by hand from a kit do not fall under this definition. The product must be crafted by the artisan, an employee (with employees not to exceed 20 total) or a member of a group of artisans and employees with no more than 100 members. Shoppers at Handmade who are members of Amazon Prime can continue to use their Prime benefits at Handmade to receive free shipping. Approved artisans can build their Handmade storefronts to showcase their work with artisan profiles and products. Amazon won’t charge listing fees for its artisans; instead, Amazon will get 12 percent of sales or 50 cents per item sold, whichever is higher. In contrast, Etsy charges a listing fee of 20 cents per item and gets 3.5 percent of an item’s sale price. Amazon charges a professional selling fee of $39.99 per month but is waiving the fee until Aug. 1, 2016, for professional sellers who primarily sell on Handmade and other Amazon categories, provided that the number of non-handmade products sold in other categories doesn't go beyond 40. Handmade is not the first time that Amazon has launched services designed to support small businesses. Earlier this year, it launched Amazon Launchpad to feature startup companies with emerging brands and innovative products as well as Amazon Exclusives for fledgling branded products from companies that Amazon describes as up-and-coming. I LOVE handmade! I have had a couple of handmade shops in the last 7 years and am in the process of changing my 5 year old handmade shop into a marketplace.